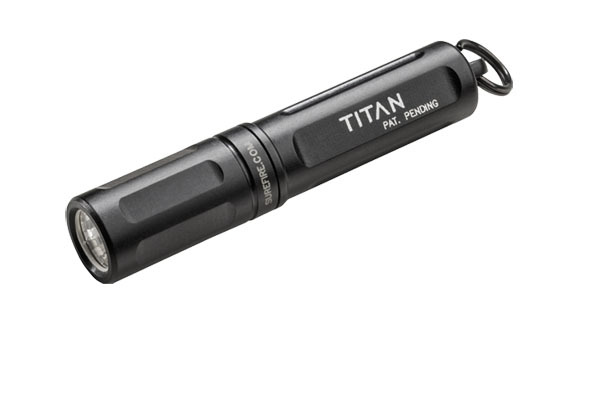 The first of its kind, the Surefire Titan is the world's first professional-grade keychain flashlight. Featuring a high-performance LED with a dual output of 15 Lumens on low and 125 Lumens on high, the Titan utilizes a proprietary reflector to shape the light into a broad, smooth MaxVision Beam.™ The Titan comes with a stainless steel split ring that securely attaches to your keys, ensuring it will always be within reach. The high performance LED is easily activated with a twist of the head and is powered by a single AAA NiMH battery (included) or AAA Alkaline battery. The finger sized Titan is sculpted from aerospace grade aluminum and is protected by a military-grade hard anodized finish to handle the rigors of day to day life.